V.com weekend vote: Have you ever named a pet after a famous musician? I was picking up my bow from my luthier friend's shop, when he told me what seemed like very startling news. "Yo-Yo has passed away," he said sadly. "WHAT?" I said, in full-alarm mode. How could such a thing be? How I have possibly missed such major news? "He was 12 years old," said my friend, "such a great dog to us." "Oh!" I said, trying not to sound too relieved. I mean, I do understand how sad it is to lose a pet. But thank goodness for the continued existence of a certain cellist we all know and love! 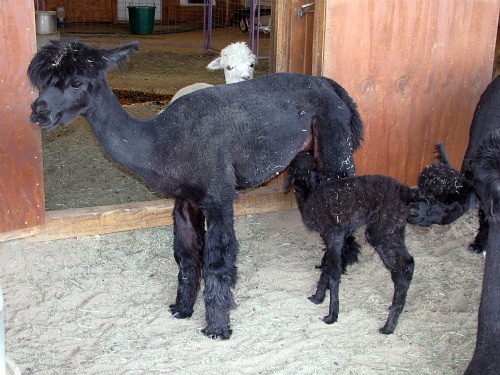 This brings me around to our question of the week, which was inspired by the alpaca breeder who e-mailed me this week, wanting to name this year's newborn alpacas after violinists: Have you ever named a pet after a famous musician? What kind of pet, and after whom? My answer is "no," but I haven't really had too many pets in my life! "We have used sculptors, opera singers, dancers, actors, painters, authors, poets, fiber artists and chefs. To give you a few examples, we've named some of our alpacas for Kiri Te Kanawa, Cezanne, Matisse, Renior, Degas, Julia (Child), Cat Cora, Emeril (Lagasse), (Anthony) Quinn, (Burt) Lancaster, Alexandre (Dumas), Shakespeare, (Shel) Silverstein, Ogden (Nash), Courteney (Cox), Penelope (Cruz), Pearl (Buck), Baryshnikov, Joffrey and Ginger (Rogers). It's fun and every year we get to look into the backgrounds of some wonderful artists." No, simply because all of our pets have been pre-named. Not really famous musician, but still, musical character! We have had cats named Rossini, Caccini, and Petrouchka. A couple of my friends told me about a violinist who named a fish, "Jascha Heifish"
No, bit I have nicknamed a few famous musicians after animals, strictly sotto voce. Don't know how many of you remember the legendary "Pet Rock". A few years ago, someone decided to market them again, not only in the familiar cardboard "carriers", but also in smaller, hard-plastic, keychain-size carriers. Of course, I couldn't resist!! :) I named mine "Sebastian", after Johann Sebastian Bach. Now that I think about it, I guess he's Johann Sebastian Rach! I wanted to name my Dad's dog Mahler; unfortunately, verbally it has a different connotation than I wanted. I'm just such a big fan of Ginette Neveu. I think they should name the alpaca Ginette Neveu. But then I think everyone should name all of their pets Ginette Neveu so take it for what it's worth. A friend of mine who's a cellist once named his labrador "Truls" after Truls Mork. A few years back, I had a stray cat that wandered into my shop and decided to adopt me. I named him Mr. Tubbs (I actually just called him Tubbs). Although not a musician, James Tubbs was one of England's most respected bow makers. I know we're talking classical music but I just had to tell you all that a friend of mine named his cat Michael McDonald. which I just think is so freakin cute and funny. also - he must be addressed by his full name at all times. he's never "Michael" or "Mike" or even "Mr. McDonald". it's Michael McDonald... tee hee. My Bichon's name is Giuseppe Guarneri del Gesu'. My vet about flipped out when I told him the dogs name. He was an old violinist. He thought it was great. I have a goldfish named Otakar. I remember folks Bloging here a few years ago giving pets musical/musician names and someone either did or suggested, "Poochini"! There were many neat ideas for names. I've never named a pet after a famous musician, but I did name my pet wild rabbit (which I released awhile ago) Allegretta "Gretta". I had an Iguauna named " DJANGO " which grew to over 2 feet long. I sadly sold him / her ? to a pet shop when I moved. The Zen like character the lizard possessed convinced me he was a composer, always busy with his art.